Is it just me or are these two pieces EVERYWHERE right now?! I keep seeing pleated skirts & bomber jackets styled in different ways & it makes me want to wear them all day every day in a different way. I've seen pleated skirts styled with classic button downs, casual tee shirts & sporty sweatshirts while bombers have been through over dresses, jumpsuits & jeans. It seems almost impossible to find a bad way to style a pleated skirt or a bomber. Believe it or not, today's post is actually slightly St Patrick's Day inspired! I'm not Irish & green isn't my favorite color, so I went for a more subtle forest green shade but I still think this bomber jacket is a great piece for this week to nonchalantly dress in the spirit of St. Patrick. Adding green to my look was surprisingly easier than I had originally thought because there are so many different shades. Looking back, I wear green more often than I realized: in a statement coat, an olive dress, a pencil skirt, even a jumpsuit. DON'T FORGET - There's still time to enter to win a $850 Nordstrom Gift Card! This giveaway is open internationally and runs until 3/20. Good Luck! Last week, we loved the way Brittany from Kingdom of Sequins and Megan from Diary of This Girl styled denim! Adore the pleated skirt with the bomber! So FUN and you are adorable!! Love the way you've paired your jacket with a pretty pleated skirt! That clutch is super cute too! What a fantastic pairing of two springs hottest trends, and with little booties because it is winter still in some parts. I love it all! No, it's not you, I'm seeing bomber jackets in every store now. My problem is I want one in every color! For the longest time I couldn't even find a bomber anywhere, now they are every where. I think the stores in my area always take a little longer to catch up to what's on the blogs. I love your bomber. I finally bought one myself, in a burgundy color. I can't wait till the weather warms up again so I can wear it! What a fantastic look Michelle! Your skirt is gorgeous and the color of your bomber is just beautiful!! I love this color blocked one! The hem is asymmetric too which is fun! Pleated skirt is so chi and you look amazing in the pics. I might need this skirt! Too good! I LUV this look, and recognized a familiar friend --> I have the exact same clutch! Isn't it the best?! I'm obsessed with the cuteness of Kate Spade! So many things to love in this look, Michelle!! I was lusting over your bomber when I spied that clutch. Then the pleats of your skirt are so delicate and pretty. And do I spy leggings? Or are those somehow a mad, brilliant part of the skirt that I'm not getting? One word, LOVE. Thank you! So glad to hear you are loving this look! YES I am wearing leggings underneath the skirt! Partly because it's slightly sheer & also because it was freezing! Such a fun outfit!! That skirt is fabulous and I love your nail color! Thank you :) I'll be posting a close up on Instagram soon ! Your clutch is too cute! You reminded me that I need to dust off my pleated skirt! Thanks so much for hosting the link-up. Don't forget to add this outfit to On Mondays we Link-Up! I'm loving the bomber paired with the pleated skirt! Such a great combo! Such a fun clutch!! It actually took me a minute to realize it wasn't an actual newspaper! LOL - It looks like one right?! Except much cuter thanks to the heart & bow! I love a pleated skirt. This one is so cute with the black white color blocking! I love the sheer black and that clutch is just adorable! 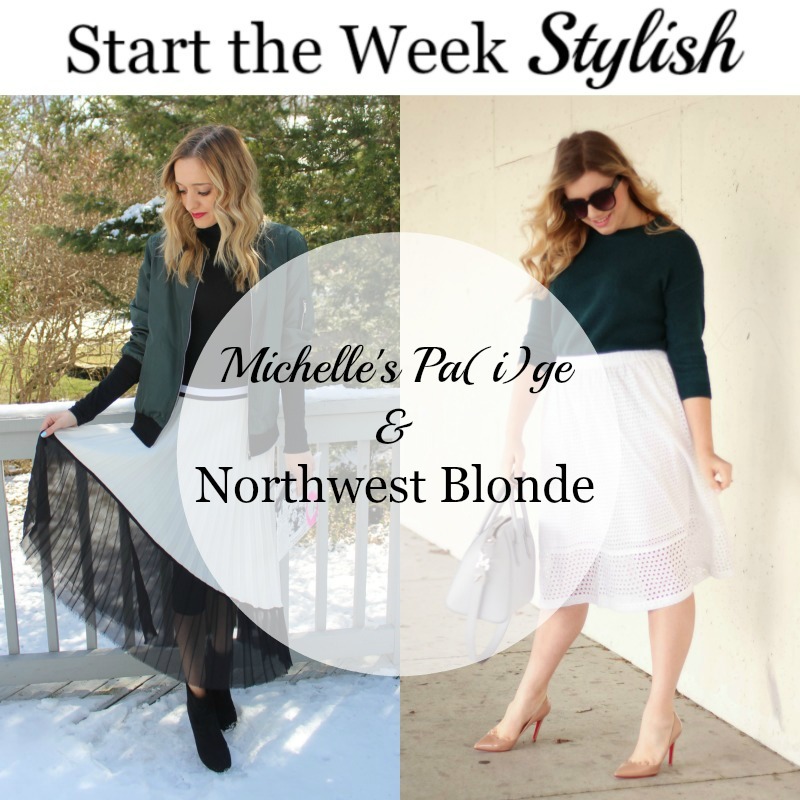 I agree with you that bomber jackets and pleated skirts are everywhere this spring, Michelle! These two pieces look adorable together! I just love these two piece together! The color of the bomber is so pretty on you. Such a chic look Michelle! I love this deep hunter as an alternative to bright green for St. Patty's! Such a fun look, lady! Yes - I realized I actually wear more green than I thought, but most of it is olive or forest green shades. Thanks for the feature!! Love this look... You look perfect for St Pattys Day! 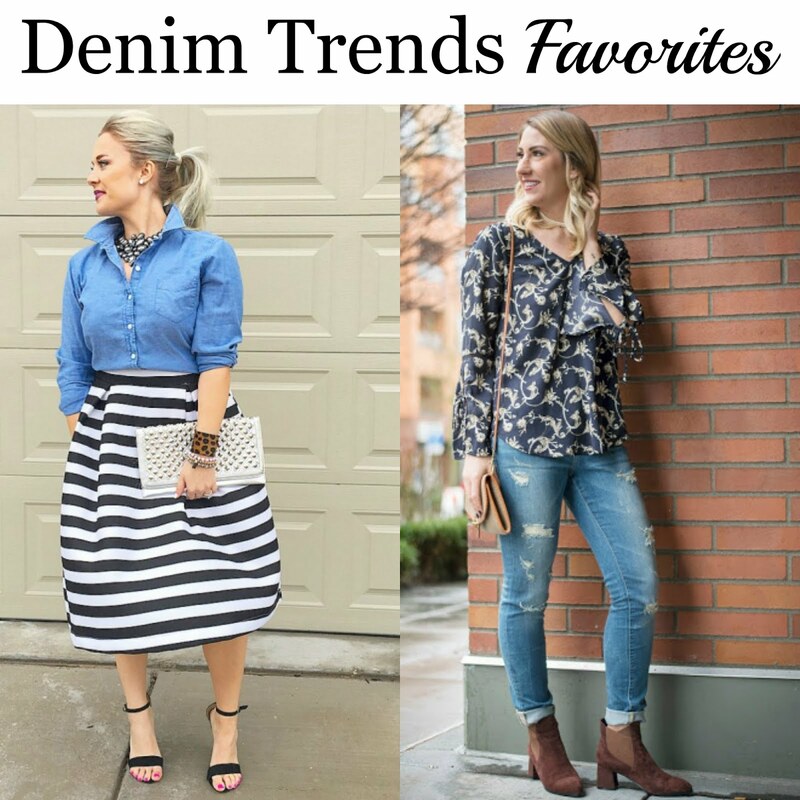 Loved how you wore denim last week! So cute with the stripes! What a great skirt, Michelle! Love how you've styled it with the bomber! So pretty! I love the pleated skirts---they are so feminine! And then adding that bomber---it's perfect! Yes! I've been seeing pleated skirts and bombers everywhere! :) I totally need to get a pleated skirt it'd be amazing to wear in the Spring! I can't get enough of your clutch too, it looks so unique and fun! Yes - a pleated skirt is definitely perfect for the spring!